Saturn’s largest moon, Titan, is weird. Really weird. Its atmosphere is unlike that of any other moon in our entire solar system — in fact, it’s a lot like what scientists believe Earth’s was like during its first billion years. Titan’s atmosphere also includes organic compounds called polycyclic aromatic hydrocarbons (PAHs), precursors to the molecules that gave rise to life on Earth. Previously, we thought they could only form under high-temperature conditions. But the average surface temperature on Titan is a frigid -179 degrees Celsius (-290 degrees Fahrenheit). Now, researchers think they’ve found the “missing link” that explains how Titan’s atmosphere could include these compounds. The knowledge could better our understanding of our own planet’s infancy and provide new clues in the search for extraterrestrial life. In a study published Monday in the journal Nature Astronomy, U.S. and Russian researchers show how gases already known to exist on Titan could have combined to produce PAHs. They did this using a combination of computer simulations and practical experiments. The finding isn’t remarkable simply because it teaches us something new about Titan — it could also help us better understand Earth’s history. 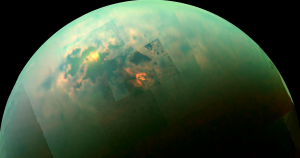 “The gas make up of Titan is similar to prebiotic Earth — hydrocarbons and nitrogen and the absence of oxygen — hence, scientists are keen to see how chemistry is evolving or has evolved on Titan to provide clues to Earth’s atmospheric content,” Berkeley researcher and study author Musahid Ahmed told Futurism. The better we can understand the conditions that led to the formation of the Earth as we know it, the better equipped we’ll be to figure out exactly what conditions are necessary for the formation of life — and where we might want to look for it elsewhere in the universe.